Power chords give way to power tubing as Pacenti Cycle Design introduces its new Heavy Mettle bicycle tubing. Designed for today's bigger riders, bigger jumpers, and 29ers, Pacenti's Heavy Mettle tubing features beefier butting on either tube end. The four piece set comes with a long 750mm downtube plus lengthened butts to enable either 29er or regular 26-inch mountain bikes to be built. Plus, the butting is asymmetrical with longer butting on one end so that the frame designer can trim the material from one end or both to fine-tune the frame's ride depending on the client and his or her type of riding. "Our Heavy Mettle tubing is perfect for today's extreme riding," says Kirk Pacenti, President of Pacenti Cycle Design. "With the beefier butting riders can perform jumps and drops without worrying whether their frame can take it, and the longer downtube makes the Heavy Mettle tube set perfect for 29er frames." In designing his Heavy Mettle tubing, Pacenti put a premium on function and durability and not weight which means the Heavy Mettle tubing set is beefy not dainty. Plus, the Pacenti-designed tube set is constructed in England. 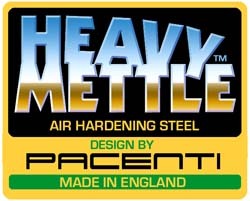 Pacenti Heavy Mettle tubing will be available to bike builders and designers by mid-January. To place an order, call (423) 954-3373. Kirk Pacenti founded Pacenti Cycle Design for the sole purpose of supplying and offering support to the artisans who build quality hand-crafted bicycle frames, with a particular dedication to lugged steel construction but is expanding his product offerings to include all materials and construction techniques. For more information call (423) 954-3373 or log onto the Internet at www.bikelugs.com.